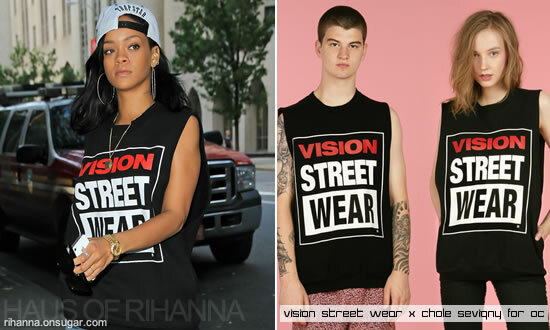 Rihanna flew from JFK to LAX wearing a white Trapstar Riders Union snapback cap and a black, sleeveless sweatshirt from Vision Street Wear by Chloë Sevigny for Opening Ceremony. The sweatshirt is sold out but a few items from that collaboration are still available. Click here to check them out. Vision Street Wear, which was founded in 1976, was born of the idea that skate culture and music are intertwined. Visit their official website to see their apparel and skateboard designs.